It is difficult to find good adventure games that focus on exploration and puzzles. I cling to The Legend of Zelda series, in part, because there are not many games like it. It is more common to find adventure games that focus on action. So I pay close attention any time I see a new adventure game that looks like it might buck that trend. Hob is the latest game to catch my attention. Hob is an adventure game with a heavy emphasis on exploration and backtracking. It feels like the result of an experiment that combined classic 2D Legend of Zelda and Metroid into a single modern package. In addition, Hob has an interesting approach to narrative: saying nothing. One of the most intriguing parts of Hob is the way it approaches storytelling. From the very beginning, you are told nothing. There is no opening cinematic to set the stage and no character dialogue to give you an objective. You just wake up and start walking. The game then begins telling the story via the gameplay, and you quickly learn about both friends and foes. This type of storytelling is very effective at the beginning of the game and serves as a sort of tutorial. After a brief introductory area, you are free to begin exploring. 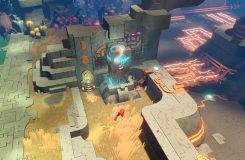 In this regard, Hob is not unlike Breath of the Wild, but the similarities end there. There is no clearly defined main quest. 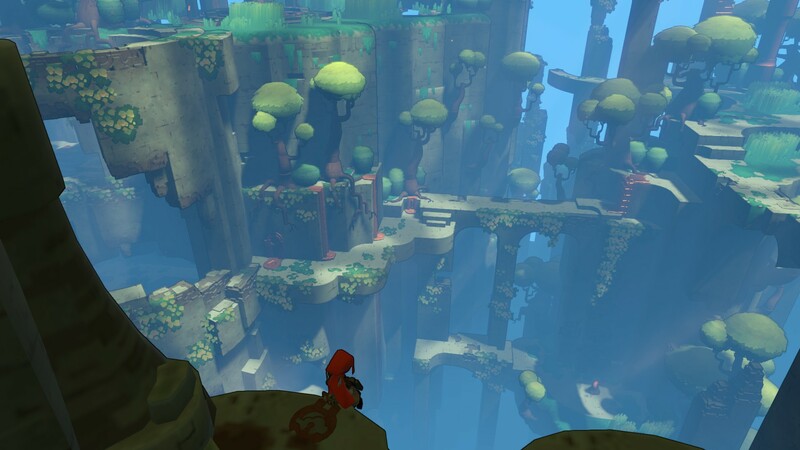 Hob drops you into a beautiful world and tells you absolutely nothing. For the first few hours of the game, that is enough. The world draws you in and encourages you to explore. However, once the newness wears off, you will realize that you have been wandering without any clear objectives. There are often markers on the map pointing you where to go to proceed, but it’s never clear what you actually accomplish when you reach those areas. You might hit a switch or open a floodgate, but why? In the long run, what does that help you achieve? 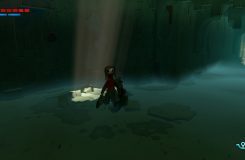 The world of Hob is beautiful, but what am I doing here? This question is never answered. Hob never addresses this problem. When I reached the end of the game, I was not certain it was actually the end. When the game did end, I was confused. What had I accomplished? Why was I in this world at all? The storytelling at the beginning of the game set the stage, but then never follows through with a proper conflict or resolution. Looking back at everything you have done collectively, you can begin to piece together a basic story, but it is a missed opportunity. I appreciate the artistic decision the developers made with the narrative, but it was poorly executed. Hob would have a stronger story if the main characters had explained even the most basic happenings, but the game as a whole may have been more forgettable if they had. Where Hob really shines is exploration. Like many adventure games, Hob begins with a fairly small area, and you unlock more areas to explore as you progress. What makes Hob different is that new areas of the world are physically added to the map when you meet certain objectives. You will quickly reach the edge of the map as you explore, but when you locate certain switches large new areas appear in front of you. It is an interesting approach that always keeps you wondering if you have actually explored the entire world. Even after exploring extensively and completing the game, I am not at all certain that I have seen every area it has to offer. 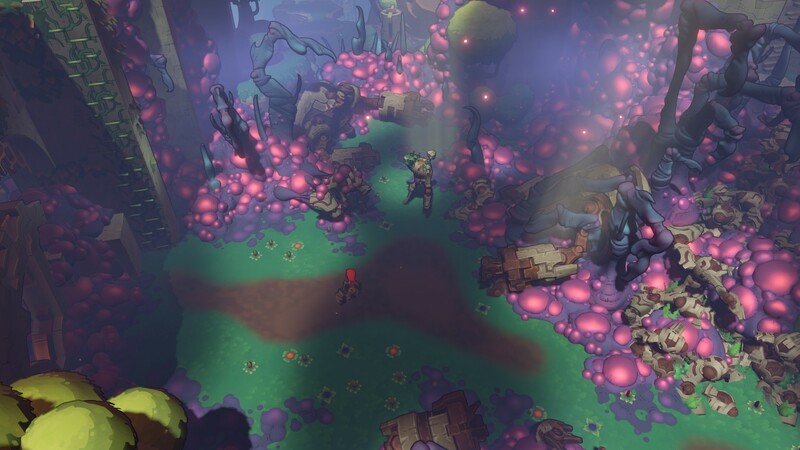 Removing the poison corrupting the land is one of the primary goals in Hob. The world is full of treasure and a variety of collectibles — some required and some optional. It is with these that every area serves a purpose. The three most important optional collectibles improve your sword, life meter, and stamina meter. Improving all three will make your adventure more enjoyable, and Hob doesn’t try to hide them. 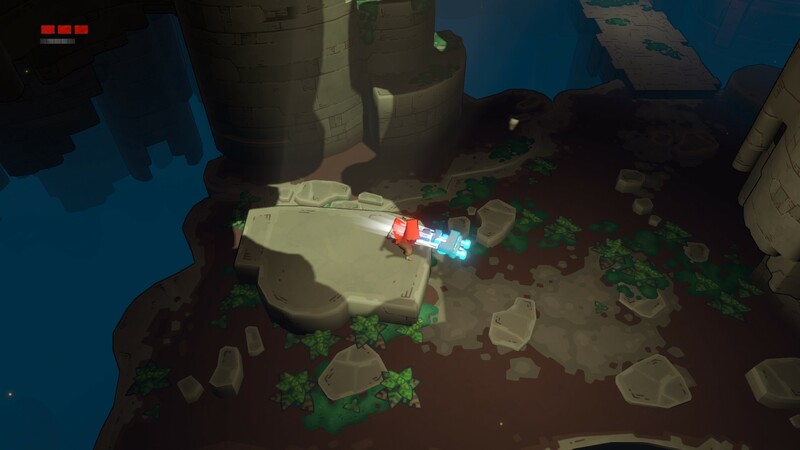 Hob marks collectibles you missed on the map as you explore. This had the potential to ruin the exploration, but I feel that it makes it more fun. More often than not, Hob hides collectibles in plain sight. The challenge is figuring out how to reach those areas; not learning that the areas exist. Again, even after finishing the game, there are collectibles marked on my map that I cannot figure out how to reach. The environment is mostly a green landscape with rivers and lakes, but the land is littered with the remains of a technologically advanced civilization. Furthermore, a deadly poison has corrupted large areas of the land. Finding the source of the poison and destroying it is one of your main tasks. The poison doubles as a way to encourage exploring areas a second time. The poison prevents access to large amounts of the land. Once it is removed, you can explore the areas again to find more collectibles. Puzzles litter the environment as you explore, but they are not a strong focus. Most puzzles consist of climbing and platforming to activate a switch. You might push a block, activate a power source, or turn a lever, but it all boils down to activating a switch to proceed. Nothing comes close to the complexity of even simple Zelda puzzles. …and other times the camera is at your feet. The constant change is jarring. Overall, I enjoyed my time exploring the world of Hob, but it does have one downside: a bad camera. Sometimes the camera is fixed, and sometimes the camera moves with you. The fixed camera areas can be frustrating when they require platforming; it is difficult to judge the locations of the platforms. Most of the time, the camera is above you, giving a top-down view of the area. However some areas, seemingly randomly, have the camera at ground level instead. It can be jarring when you walk through a door only to find that the camera in the next room is completely different. It feels like you are switching between playing A Link to the Past and Crash Bandicoot without warning. Exploration is clearly the focus of Hob, but you are not free to explore unhindered. The collectibles are guarded by monsters. Hob does not place a heavy emphasis on combat, but you are provided a carefully selected arsenal. Enemies are not pushovers. A mistake can quickly lead to a game over (which thankfully does not punish you severely). This strong punch is the first special ability you learn. It is versatile and used for both combat and puzzle solving. Your primary weapon is a sword, and you begin with a very basic two-strike combo. As you progress, you will unlock three special abilities that are used both for combat and exploration. You can also learn to block, and you begin the game with a dodge roll. That’s everything you are provided. The result is a game that has very thoughtful combat. You never just run into battle and start hacking away. You need to carefully block and dodge before making your attack. During the second half of the game, enemies gain additional defenses that must be destroyed with your special abilities. This type of combat is very interesting at first but has the potential to get old quickly. Hob solves this problem by making enemy deaths permanent. Very few enemies ever respawn. The combat also stays fresh with the help of upgrades. The sword itself can be upgraded to deal more damage, but there are also special skills you can purchase to add additional effects to your abilities. All the effects are optional, so you can mix and match the effects you like best to suit your play style. Hob is not a very long game, but I thoroughly enjoyed the time I spent exploring the world. If exploring new worlds is what draws you to adventure games, then Hob is definitely worth your time. You can easily spent 10-15 hours exploring the world and tracking down every last collectible. On the other hand, if you’re interested in challenging puzzles or an engaging story, then you are better off playing something else. Hob‘s approach to storytelling is interested but executed poorly, and the puzzles serve as more of an obstacle preventing exploration than a real challenge. Joshua is the content director of Zelda Universe and long-time executive of Zelda Wiki who previously founded Zelda Relic. Wielding an undying passion for Zelda, he works behind-the-scenes to build collaboration in the Zelda community.